Aulis was an ancient Greek town located in Boeotia with a harbour upon the Euripus Strait; and is thus positioned three miles south of Chalchis, the town upon the island of Euboea. In antiquity, Aulis was talked of as being upon a rock peninsula between two bays. Aulis was never a polis, an ancient Greek city state, but rather was a town beholden to other poleis, notably Thebes. ​The town of Aulis was said to have been named for the daughter of King Ogygus, the first ruler of the land that would become known as Thebes, and Ogygus’ wife, Thebe, a daughter of the Titan Prometheus. This Aulis was named by some as being of the three Praxidicae, goddesses of justice, who ensured that oaths were respected. ​In Greek mythology, Aulis is famous for being the location where the ships of the Achaean fleet gathered prior to sailing to Troy; Agamemnon having invoked the Oath of Tyndareus to bring together an armada to bring back Menelaus’ wife, Helen, from Troy. 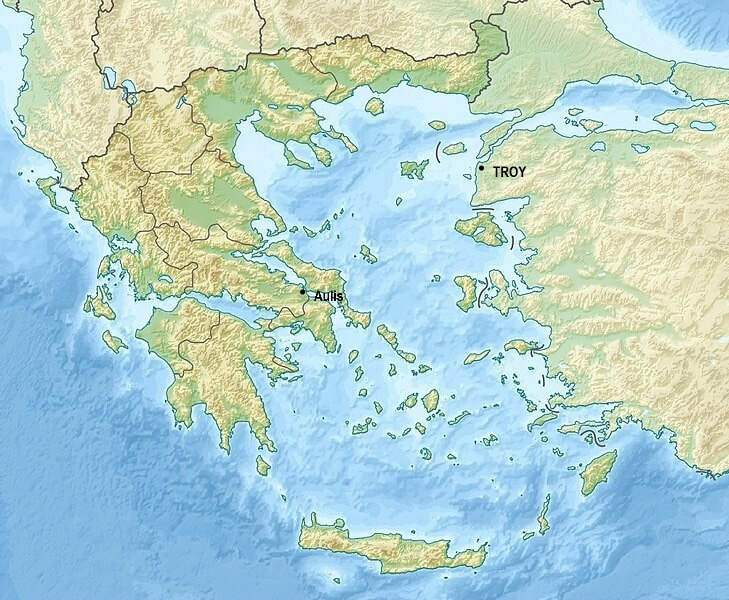 According to Greek mythology “a thousand ships” gathered at Aulis to retrieve Helen from Troy, but according to Strabo, only 50 ships would fit within the harbour of Aulis, but the Euripus Strait and South Euboean Gulf is sufficient in size to allow a thousand ships to gather. ​Remnants of a Temple of Artemis can be found today at Aulis, and tradition has it that this temple was constructed by Agamemnon, King of Mycenae and leader of the Achaean forces during the Trojan War. The link between Agamemnon, Artemis and Aulis, goes beyond the construction of a temple though, for Aulis was also the location where Agamemnon had to sacrifice his own daughter, Iphigenia, to appease Artemis, and allow favourable winds to take the Achaean armada from Aulis to Troy.